January and February have been very eventful months for CWEP! From Steering Committee meetings to Creek Week meetings to library, school, scout, STEM, and festival programs, CWEP has done it all- and we are on track to meet our goal of reaching all members before the end of June! First, we had our quarterly Steering Committee Meeting on January 22, 2019, where we discussed program updates, direct education recaps, and reviewed our 5 year plan. In addition, CWEP recently added a new page to the website called “Steering Committee” where you can find all updated Agenda’s and Meeting Summaries! We want our partners and communities to be in the know at all times. Secondly, our CWEP family has grown with the addition of a new Water Resource Planner who will be working closely with CWEP this year! Welcome to the team, Maya! In addition to our successful committee meeting, CWEP also continues to participate in the monthly planning meetings pertaining to a week-long event in Durham called Creek Week. Creek Week is a time to discover and clean up local streams. It has been celebrated by Durham since 2009. It is a successful event in helping to rid trash from local creeks, as well as getting the community involved in their surrounding environment. This year, Creek Week is from March 16-23rd. Individuals can sign up for multiple events that occur during this week through this page: https://keepdurhambeautiful.org/creek-week/ CWEP has also added a new Creek Week page to the site which outlines all the creek weeks in North Carolina! CWEP will be hosting a “Canines for Clean Water” Dog Pledge event during Durham Creek Week 2019 on March 18th from 4-6 PM at Piney Wood Dog Park in Durham. Stop by with your four legged friend, sign a pledge promising to pick up dog waste, and get some treats- We hope to see you there! CWEP has been doing a lot these past couple months- but we have even more eventful months coming up! Check out our new Calendar of Events page to see what we’re up to next! We also have a ton of new pictures out in the field that you can check out here! Creek Week is a time to discover and clean up our local streams through recreational, educational, and volunteer opportunities! It has been celebrated in Durham since 2009, with 2,783 volunteers collecting 152,798 pounds of litter to date. Please refer to CWEP’s Creek Week page to learn more about Creek Week happenings throughout the state of North Carolina this coming March! Did you know that pet waste contains bacteria and parasites that can pollute our waterways? Pet waste also contains high levels of nutrients that can enter our streams and lakes, contributing to harmful algae growth and invasive aquatic weeds. This harms the freshwater organisms, and produces toxins dangerous to humans and animals. For Durham Creek Week 2019, stop by Piney Wood Dog Park and have your four-legged friend sign a pledge promising that he/she will pick up their waste! In exchange for signing the pledge, your dog will receive a copy of the pledge, some dog treats, and a biodegradable dog waste bag! To learn more about all of the events taking place during Creek Week 2019, check out Keep Durham Beautiful’s events page here. As we come into cooler, winter months, it’s time to start thinking about any additional maintenance that needs to be done with the rain water harvesting systems you may have! A rain barrel collects and stores rainwater from your roof through a drain (gutter) system for future use such as watering lawns and gardens. Rain barrels come in a variety of sizes, but a 55 gallon container is the most common size. Rain barrels can be added to any building with gutters and downspouts. You can construct a rain garden yourself, or purchase one already made- but they all serve the same purpose: to collect rainwater and decrease the amount of stormwater runoff that leaves your property. Using rain barrels is one way to decrease your household’s impact on local waterways and to become a good steward of the local watershed. The average rainfall of one inch within a 24-hour period can produce more than 700 gallons of water that runs off the roof of a typical house. Much of this water runs from gutters onto surfaces that do not allow water to soak into the ground. These are called impervious surfaces and include concrete, asphalt, and compacted soil. Even commonly used sod has a very low infiltration rate and can be a major cause of increased runoff. As it flows, runoff collects and transports soil, pet waste, salt, pesticides, fertilizer, oil and grease, litter and other pollutants. This water drains directly into nearby creeks, streams and rivers, without receiving treatment at sewage plants. Polluted stormwater contaminates local waterways. It can harm plants, fish and wildlife, while degrading the quality of water. How to maintain your rain barrel? Rain barrels need regular maintenance, similar to other features of your property. It is especially important to remember to drain water before every storm and to remove debris and sediment from your barrel regularly. ✔Check the entire system (gutters, debris filter, pipe, spittings, spigot, etc) to ensure the barrel is functioning properly. ✔Place gutter guards and/or screens on top of roof downspouts and on top of the barrel to prevent leaves and sediment from entering the rain barrel. ✔Remove leaves and other debris from the screen at the top of the barrel, the overflow pipe, and the roof gutters. ✔Regularly use water in your barrel between rain events to make sure there is room to collect rainwater during the next storm. Drain your rain barrel before the winter season! ✔If your rain barrel has a filter screen, make sure it does not have holes and securely fastened to keep mosquitoes out. ✔Unless your rain barrel is made out of a material specifically designed for freezing temperatures, disconnect it during the winter to avoid damage. Around thanksgiving, disconnect the rain barrel from your downspouts, empty and wash the barrel, and store it upside down. Re-connect your rain barrel to the downspouts around April Fool’s Day. ✔Open the rain barrel spigot if you are going to be away from your home for a long time during the holidays- make sure it will drain away from your foundation. ✔Clean the barrel using a non toxic substance such as vinegar to remove residue or algae. ✔If you find mosquitoes in your rain barrel, you may add a quarter dunk monthly depending on the size of your rain barrel. X Don’t leave rain in your rain barrel for long periods of time. X Don’t drink the water in your rain barrel or use the water inside your home or for your pets. This water should be used as non-potable water. X Don’t let kids play in or around rain barrels. X Don’t forget to re connect your rain barrel after the winter season. X Don’t spray the water directly on vegetables or plants, as it may contain bacteria from the roof. X Don’t let the barrel foundation become unstable or tip over. Who is responsible for this maintenance? As the property owner, YOU are responsible for all maintenance of your rain barrels. Why is it important to maintain your rain barrel? By maintaining your rain barrel, you are doing your part to conserve rainwater and protect your local streams. You can prolong the life of your rain barrel and save money on maintenance costs by regularly maintaining and inspecting the rain barrel to ensure everything is running smoothly! In 2018, the City of Raleigh’s 2018 Capture it! Stormwater Arts Contest was a huge success! This annual contest is an opportunity for students in 8th through 12th grades to capture the importance of stormwater runoff through art and film. This will ultimately bring more awareness to the positive impacts the community can have on the environment by keeping waterways clean! In 2018, winners for three categories were announced at the 11th Annual Environmental Awards this past March. A photo of last year’s rain barrel winners are shown below. Now…here are the details for the year ahead! Registration is currently open for Raleigh Stormwater’s annual Capture it! Stormwater Arts Contest! Create a film or artwork that shows how the community can reduce pollution to Raleigh’s streams and lakes. This brings more awareness to the importance of protecting local waterways by keeping trash and other waste out of storm drains. Winners in each category will receive a $500 prize and will be recognized at the 2019 Raleigh Environmental Awards for creating a 60-second video or painting/drawing for a rain barrel or storm drain cover. Registration is open until Feb. 1, 2019. Submit an entry today. Stormwater runoff can come in many forms, including melting snow. Winter snow often brings a unique feel to North Carolina as it doesn’t happen often: making for beautiful photos and lots of family fun. However, it’s not long before the sun comes out to expose a host of issues created by the melting snow. Heavy rains sweeping across your yard and driveway carry pollution and high volumes of water into our nearby streams, lakes, and other waterways. Melting snow does the same things. Both rain and snow melt can seriously impair North Carolina waters when they travel over the land in our developed communities. In winter, melting snow actually causes a few unique stormwater problems. Because the ground is often frozen at the surface, melting snow can’t infiltrate into the soil the way a light or moderate rain would be able to. So even a small amount of snow can cause localized flooding on your property. When snow builds up over several small storm events without melting in between, it can turn into large winter storm impacts when it finally does melt – leading to potential community wide flooding events. 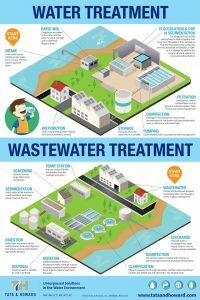 In both cases, that standing and flowing water on the ground is picking up all kinds of debris, pollutants (especially deicing salts and chemicals), and litter that will find their way into nearby streams. When shoveling/plowing snow this season, pay attention to where you place it. Try to pile snow in areas where it will have a chance to infiltrate, not runoff! Normal snow accumulation does not pose a threat to rain gardens, so there is no need to shovel a rain garden. However, heavy snow loads can weigh down and saturate your garden and hurt plants. Pile snow uphill from the rain garden so when the snow melts the rain garden can do what it is designed to do. Pile snow in locations with the most opportunity to infiltrate into the ground. Pile snow in areas where water does not pond. Clear your downspouts to allow melting roof snow to flow and not collect at your foundation. Pay special attention to places that are eroding during snow melt, and make a plan to improve these areas in spring using plants that can slow and stop erosion, like native grasses and meadow plants or native trees and shrubs. Do not pile snow on top of storm drains or near water bodies and wetlands. Do not pile snow onto rain gardens or bio retention areas. Do not over use de-icing chemicals and salts, and avoid spreading around sensitive areas like waterways and your private well. More salt does not equal more melting snow. Follow product instructions when spreading deicing material and give it time to work. Sweep up any material remaining after the snow/ice melts. When temperatures hit 15° F or below, salt is not effective. Consider using traction materials that contain an acetate, potassium chloride, magnesium chloride, or cracked cornmeal instead of sand or kitty litter.